Cargo Handling:Fitted with four electric hydraulic deck cranes of 16 tons SWL suitable for grab handling. Engine : Two 12 cylinder Ruston & Hornsby medium speed oil engines, 12,000 bhp 15 knots. October 1972: Completed by Haugesund Mekaniske Verksted, Haugesund (Yard No. 44) for H. Hogarth & Sons Ltd., Glasgow. Scottish Ship Management Ltd., Glasgow, managers. Maiden Voyage: Haugusund to Casablanca, loaded phosphate for Japan. September 1974: Re-engined by Amsterdamsche Droogdok Maatschappij, Amsterdam with two Stork Werkspoor Diesel 12 TM 410 Medium Speed Engines. 12,000 bhp 15 knots. 1982: Sold Tanjong Shipping Co. Sendirian Berhad. Scottish Ship Management Ltd., Glasgow managers, Singapore flag, renamed TANJONG PASIR. 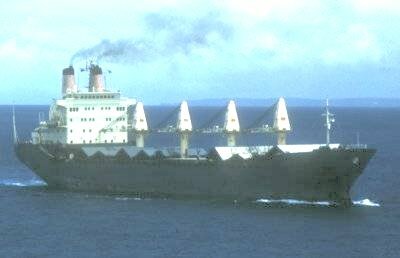 1983: Sold Eastern Bulkers, Hong Kong flag, renamed KILCHRENNAN. 1983:	Sold Corozal Compania Naviera S.A. Greek flag, renamed RENA. 1987:	5th January. Broken up at Kaoshiung, Taiwan. Photo by I. Warner, Info - J. Drury.